Vehicles and vehicle lovers crowded the beach at Indian Lake during the annual Beach Spectacular. 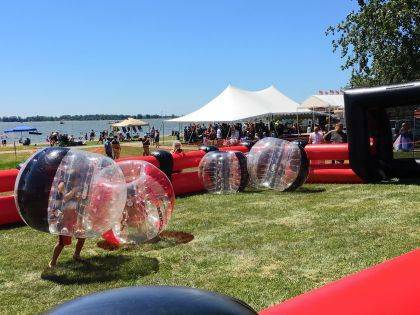 Knocker Ball was a new event at the Beach Spectacular this year and it was a big hit. How can you go wrong with a mixture of sunshine, water, a sandy beach, perfect weather, elephant ears, food vendors, boating, fishing, games, pageants, a car show, talent contest, a gigantic fireworks show and thousands and thousands of spectators? Well, you can’t really. Those are the solid ingredients for frolic and fun and that’s what an Independence Day celebration should be. And that’s what it was, pure fun in the sun, all day long and spectacular fireworks all night long. This was the 2018 Beach Spectacular at Indian Lake on July 7 and the crowd was huge! Daytona Beach huge. The parking lot was full, the overflow parking in the grass was full and the beach was packed. Many arrived on foot. People lined up chairs on the sides of the roads for the fireworks show. There were tents and pop-up canopies everywhere you looked. As early as 11 a.m. the beach was nearly full, food trucks packed the walkway and the new event this year, Knocker Ball, was going strong. The festivities started off with the car show, followed by the Lake pageant show, then the Indian Lake’s Got Talent show kicked off and wrapped up before the fireworks show. It was quite a spectacle all day and night and that’s why they call it the Beach Spectacular. 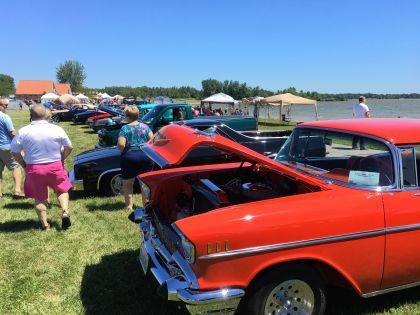 https://www.weeklycurrents.com/wp-content/uploads/sites/13/2018/07/web1_photo1Web.jpgVehicles and vehicle lovers crowded the beach at Indian Lake during the annual Beach Spectacular. https://www.weeklycurrents.com/wp-content/uploads/sites/13/2018/07/web1_Photo2Web.jpgKnocker Ball was a new event at the Beach Spectacular this year and it was a big hit.